Honey bees are amazing creatures who work harmoniously together to produce the sweet, tasty honey we all know and love. Although they look similar, within a hive there are three distinctly different honey bees, each playing an important part in the honey making process. These include the Queen Bee, the drones and the worker bees. Every hive consists of one Queen Bee, hundreds of drones and 20,000-80,000 worker bees, along with brood (eggs, larvae and pupae). The role of the Queen Bee is to lay fertilized eggs. She does this by mating early in life and storing millions of sperm within her body. When she’s ready to lay eggs, she can lay up to 2,000 eggs in a single day! 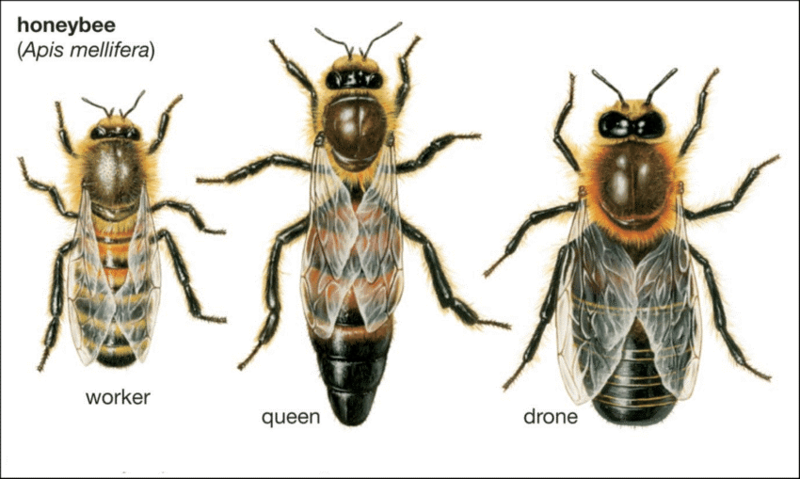 Drones are the male honey bees, who are hatched from unfertilized eggs. Their sole task is mating new queens. They don’t have the body structure to collect pollen or nectar and they also don’t have a stinger. The worker bees are female honey bees who oversee the maintenance of the hive, and although they’re female, they cannot produce fertilized eggs. The worker bee forages for food, ventilates the hive during the summer, stores honey in the hive for the winter, builds comb, feeds larvae and defends the colony with their stings. Every bee within a hive plays an important role, but worker bee’s are the true definition of the saying ‘Busy as a Bee!’.